Thanks for visiting - enjoy your holiday weekend! 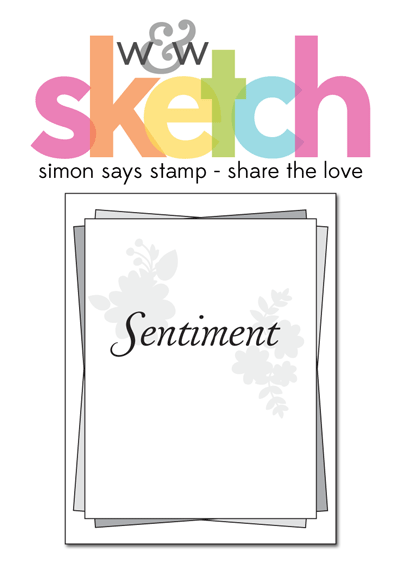 Today is the final day of Winnie & Walter's Share the Love week, featuring Simon Says Stamp, and we have a sketch to work with. 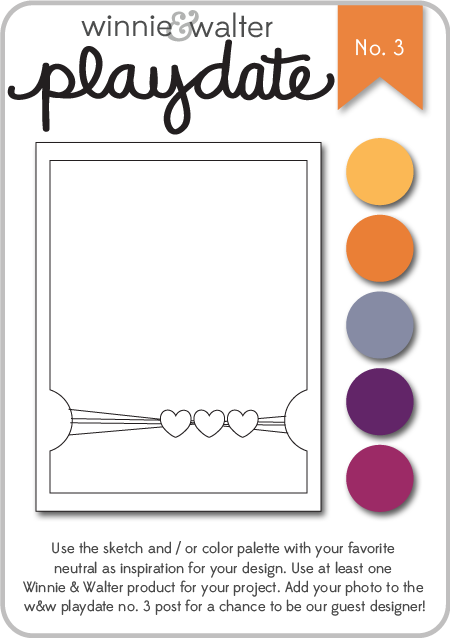 Today's challenge at the Winnie & Walter Blog during Share the Love week with Simon Says Stamp is One Layer cards. This idea came to me almost immediately. I just love the effects you can get with Simon's MaryAnne Snowflake stencil! I paired it up with W&W's Big Bold Seasons, masked off the sentiment panel, and then moved my stencil around and pounced on broken china, salty ocean, and peacock feathers distress inks. I added some iridescent sequins that I got in several of Simon's Card Kits, plus some teal ones from my friend Carol. I love how they give a nice sparkle, just like real snow does! 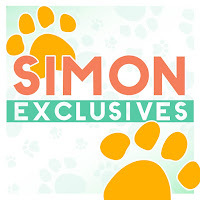 This week, Winnie & Walter is teaming up with Simon Says Stamp with a whole week of challenges and giveaways! I repeatedly stamped the chevron, then trimmed my panel, lined it in black, cut out a circle for the rest of my sentiment, and then popped the panel above the card base, after stamping that sentiment. I made this as sort of an encouraging "today is a new day" card, for someone going through a rough patch. Thanks for hanging in with me for this long post, and for your visit and kind comments. 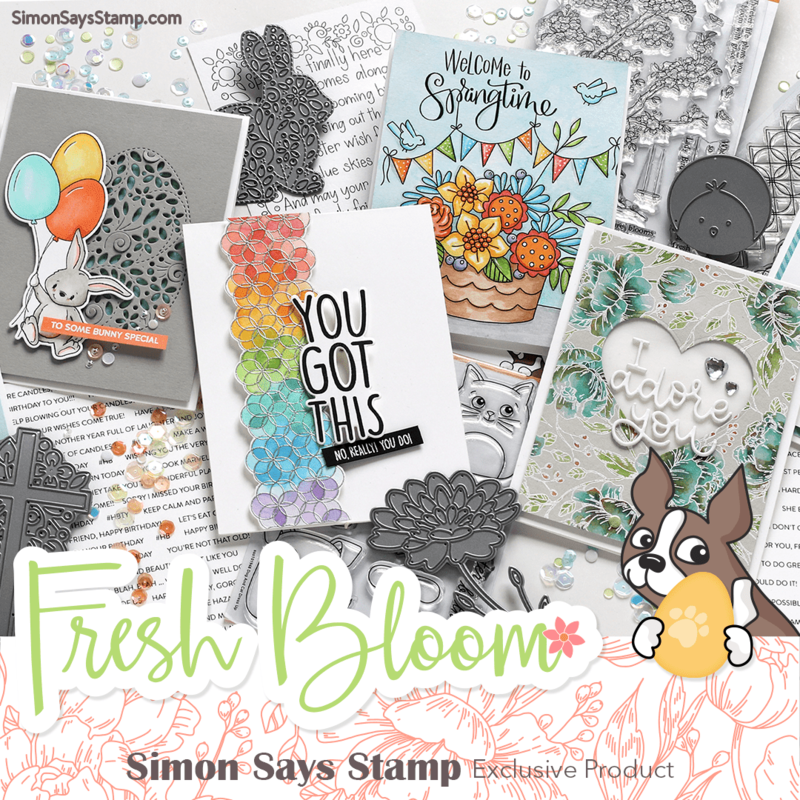 It's the last Wednesday of the month, and that means it's time for your favorite challenge at the Simon Says Stamp Wednesday challenge: Anything Goes!! The design team are all using products from Memory Box, and we'd love to see you using them, too, but it's not a necessity in order to play. I love their dies, and made 2 cards today using 2 of them. These sweet little flowers are called Bella Bouquet, and I decided to make them into some little forget-me-nots and used some blues from my personal stash, along with Apple Green stems. After piecing the flowers to the stems, I glued the bouquet to a white panel, added some pale blue Hero Arts pearls, and framed it up with a pale blue cardstock, edging the right side with a scallop punch. My sentiment is from Simon's Handwritten Sentiments and I added a dyed seam binding bow, secured with a pearl brad. And for my second card, I had a play with this Memory Box Gorgeous Gardenia die and used papers from Graphic 45's Secret Garden collection. My sentiment is from an Impression Obsession set called In a Garden, and I added some sequins to the design. to the fantastic Simon Says Stamp Store!! 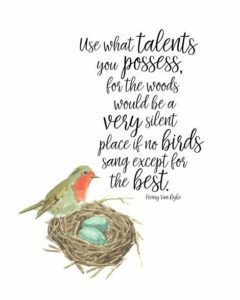 I'm looking forward to seeing what you all create this week! I've done a few wreath cards lately, and I thought I'd do one more for the AEI♥U challenge: Sequins. Over the weekend, Cat hosted one of our scrambles at the Hero Arts flickr group. She posted a picture of a tote bag she had made, and some cards that they inspired, and challenged us to be inspired by what we saw in her photo. Love how this turned out! 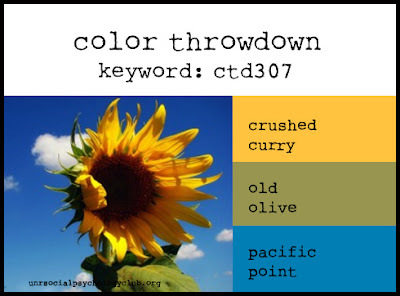 I don't think I'd have put these colors together without a push from Cat! I promise these are the last Christmas cards you'll see from me for awhile, but since I had everything out, I found this pad of Simple Stories Handmade Holiday papers and decided to make a couple more country-style cards. This one has no stamping, no die-cuts, just the papers from the pad. Since I wasn't doing too much that was creative, I decided to add some hand-stitching (using a We R Memory Keepers stitch piercer) in between each of the panels of paper. And I colored some wood veneer stars with a red marker and glued them over the ornaments on the tree. The twine is Lawn Fawn. This next one uses just 1 of the papers - I love the bits of music, the swirls, and the snowflakes in it. I simply added it to a cream card base and, to enter the Pretty Pink Posh die-cut blog Hop, added a Simon Merry Christmas die-cut and a Sizzix (?) snowflake die that I think is now discontinued;I think it originally came with the first Cuttlebug machines. I borrow it every couple of years from my friend Yvonne and cut a zillion of them. I added a Prima wood button that I also darkened with a marker, threaded with some twine. 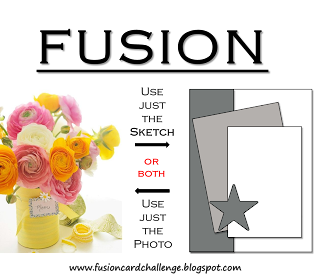 and both of these cards to PaperCrafts & Scrapbooking Holiday Cards & More link party. This weekend Pretty Pink Posh is hosting a blog hop that is to feature die cuts, and after I'd made my Christmas wreath HERE, I remembered I also have a leafy wreath. So I decided to use it to make an autumn card. I cut the wreath 5 times out of various fall-toned papers, many of them from the Core'dinations Darks stack, and layered them so that hopefully a bit of each color shows. The twine is a triple bow. I can't believe it's August, and I'm making a Christmas card, but there are 2 challenges that this will work for: Pauline's Pretty Pink Posh Cutting Edge Blog Hop, and the link party at PaperCrafts & Scrapbooking. The grapevine wreath is cut out twice and layered to make it thicker. I bought 2 pads of these Aspen Frost papers last year just because of this particular paper, and I couldn't resist adding my little country checked ribbon. It was a happy coincidence that I just received an Avery Elle stamp set that I've had on my wishlist: Let It Snow. And today the newest AEI♥U challenge was announced: to use sequins. I thought adding sequins to this fun set was a perfect match, so here is my entry and the first inking of my new stamps. I have a memory of walking home with my Mom in the dark during a snowstorm that closed the roads. So everything was quiet and sparkly, and that's what I was trying to recreate here. I made my card into a shaker, adding diamond dust and irridescent sequins inside, and stamping and embossing the sentiment in silver. The snowflakes are punched from silver foil, and I scattered a few more of the same sequins on the outside of the card also. Thanks for your visit today - have a great weekend! eta: I'm also entering this into the Holiday Crafts & More link party at PaperCrafts Connection. Here's a couple more cards for Winnie & Walter's Playdate #3 challenge. For both of them, I started with a piece of watercolor paper, and, changing distress inks each time, repeatedly stamped this Hero Arts Maple Leaf across the surface, spritzing the stamp each time after inking. After my panel was completely filled, and dry, I spritzed the whole panel once again with water until the colors started to melt together, then blotted it with a paper towel. I LOVE the results, and each one is always different. Here are my cards. Having just received their Big, Bold Seasons set, that was a given. I stamped it in rusty hinge distress ink on a piece of vellum. The Darice embossing folder called Fall Leaf Background is also new. I embossed it on some cream cardstock and lightly pounced an antique linen distress ink pad over it to bring out the details. I affixed the vellum panel and then added the background panel to a grey card base. Using the Impression Obsession Small Leaf Set, I cut out lots of leaves in golds, oranges, russets, and purples (which are looking brown here; need to use a brighter shade next time) and made them cascade down my card front. As always, thanks for visiting, and I appreciate those of you who take the time to leave comments. 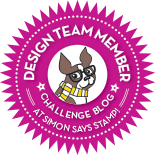 Wednesday again, and we're starting another challenge at the Simon Says Stamp Wednesday Challenge Blog! 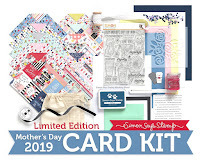 Our theme this week is Back to School, and the design team are using products from My Favorite Things, a company with so many wonderful stamps, inks, dies, and stencils! Here's my first card, using one of their Pure Innocence images, called Book in Hand. These sweet little girls are always fun to paper-piece; I just colored in her skin and hair with markers and used papers from Simple Stories Smarty Pants for her outfit and the background of my card. This pad has some great patterns, both large and small, perfect for paper-piecing and backgrounds. I added some twine and a wooden star at the top for some dimension. And while I was at it, I pulled out another Pure Innocence image that I got last year for this challenge and used the same Smarty Pants papers, along with a brand spankin' new Bella Blvd. Hello Autumn dp that I recently won (the leafy green background). This one gives a nice autumn feel with these colors. 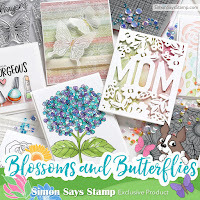 for one lucky random entrant to our challenge, to spend at the Simon Says Stamp Store! 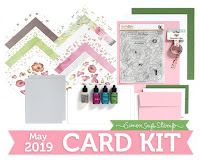 Have you seen the new September Card Kit from Simon Says Stamp? It's particularly appropriate for September and the start of school, as it's all about books! I had such fun with the stamp set! I used the included mini Gathered Twigs distress ink pad to stamp my shelves and picture frame, and then pulled out some of my favorite colored inks to build the rest of my card. The stamp set is called "To Thine Own Shelf". The card base on this and my next card used Simon's khaki cardstock, which is in the kit. The papers and stickers included in the kit are from October Afternoon's Public Library collection, and I had to build a card around that cute little boy in a circle, as I often get lost in a book! The wooden dots are also in the kit. Hope these have given you some ideas on how to use the kit. I'll see you back here again Wednesday for our regular Wednesday challenge at Simon Says Stamp! Here's a card I made a little while ago, but never shared here. I combined one of my favorite flower stamps, Penny Black's Petal Party, with a favorite Hobby Lobby music paper. The papers for the flowers, leaves, and striped background are all from Simple Stories Vintage Bliss. My sentiment is from Wplus9's Blanket Stitched Blooms. 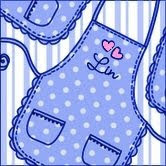 I added black enamel dots from MME Record it! Charmed collection. It's a new week! Have a productive one! Those colors were just too fun to not play, so I ended up with 2 cards for it. I just received some new Spectrum Noir colored pencils, the Essentials and the Primaries sets, so I wanted to play with them a bit, and this Stampendous Jar Bouquet stamp is new, too. So I colored it up, doing my best to match the colors from the inspiration, and also followed the sketch. I added a little Michael's rose as my embellishment, and the striped panel is from Lawn Fawn's Let's Polka pad. This one uses a Darice embossing folder, Bold Daisy, which I embossed and then smooshed my picked raspberry, spiced marmalade, and mustard seed distress inks carefully over, before cutting it into panels and lifting it above my Walter & Winnie Big, Bold Seasons sentiment. The added sequins are Lawn Fawn's. 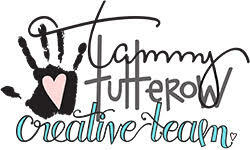 I've had this layout on my mind ever since I saw it on one of Debby's cards on Day 6 of the Stretch Your Stamps 2 class. I just thought there were some unique ideas on it, and even though I didn't do much stamping on this one, I wanted to see where it would lead me. On her card, Debby stamped, colored and dry embossed on a piece of balsa wood, and I thought it was such a fun idea. So last week when I was out and about I saw a sheet of cherry veneer and wanted to see how it might work. The maple leaf is a die-cut using it. It is so thin I had no problems, though I was too chicken this time to try stamping or coloring on it; that will be for another time. So, following Debby's recipe, I chose some pieces of patterned paper (mostly from Authentique's Thankful collection) and put together this card, using another of the same Stitched Leaves dies from Lawn Fawn, and adding some enamel dots and a copper sequin and securing them with a tiny Hero Arts clothespin, tied with a bit of twine. 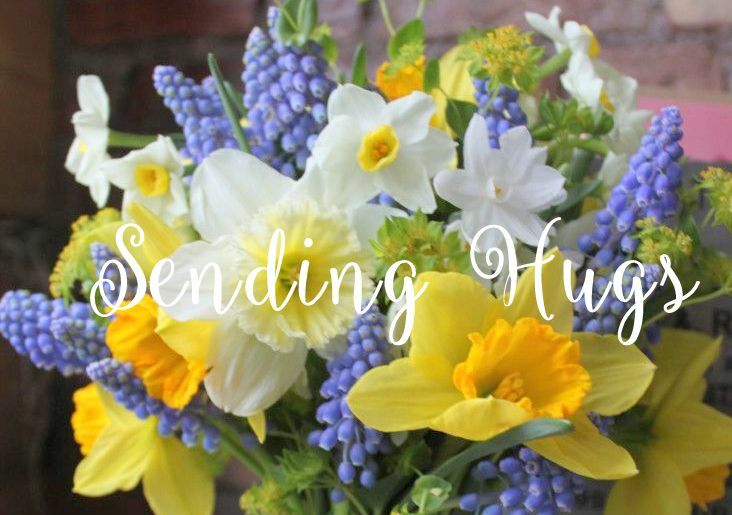 The sentiment is part of a larger one from Clearly Besotted's Autumn Flowers, and the die-cut hello is Simon's. The weather here in NE Ohio has turned decidedly fall-like, with lows close to the 40's overnight! I love it, as the heat and humidity that is usually August is something I just grit my teeth and get through. I guess this unusual weather has me thinking of my favorite season, fall. Thanks for your visit; enjoy the rest of your weekend! I'm loving the beautiful cards that are being made as a result of Dawn's lesson on Day 9 at Stretch Your Stamps 2, where she taught us to doodle around a stamped floral image. The difference to me is astounding! Thanks again for visiting today!